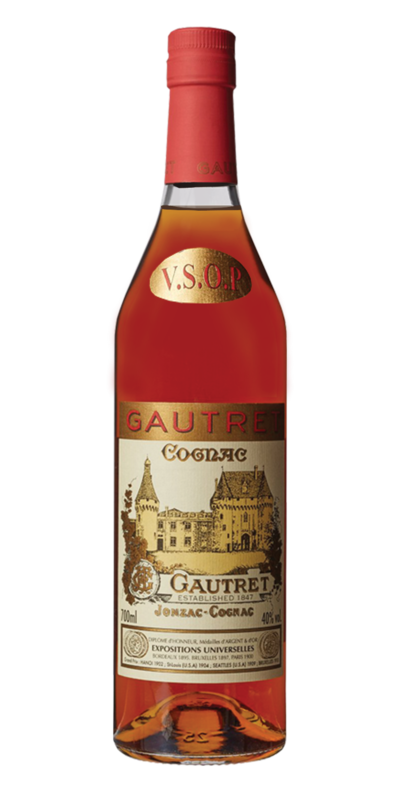 Jules Gautret V.S.O.P Cognac — Emporia Brands Ltd.
Jules Gautret is a Cognac house that proposes 19th century traditional values to a 21st century market. The Gautret family have ancient roots in the southern part of the Cognac region, and were, in the 19th century, owners of the Chateau of Jonzac, which is now the town hall for which the family have long provided mayors. The house of Jules Gautret has been producing Cognac in Jonzac since 1847, during the reign of King Louis Philipe. Today, it is supplied by roughly 500 growers around the Charente region, who provide the cellar master with an enviable variety of styles with which to create his blend. They have a range of their own stills, located under the same roof as the cellars where the fine spirit matures in limousin oak casks. Jules Gautret V.S.O.P Cognac is made according to time-honoured Charentais techniques, this Cognac suits any occasion: neat or on the rocks, before or after a meal, or combined with sparkling water or tonic as a long drink. Equally good in cocktails this V.S.O.P Cognac is a great drink to share or simply as the mood takes you. Nose: Refined yellow fruit aromas with delicate floral over-tones and a hint of honey. Palate: A subtle blend of elegant, light Petit Champagne and smooth, round Fins Bois.